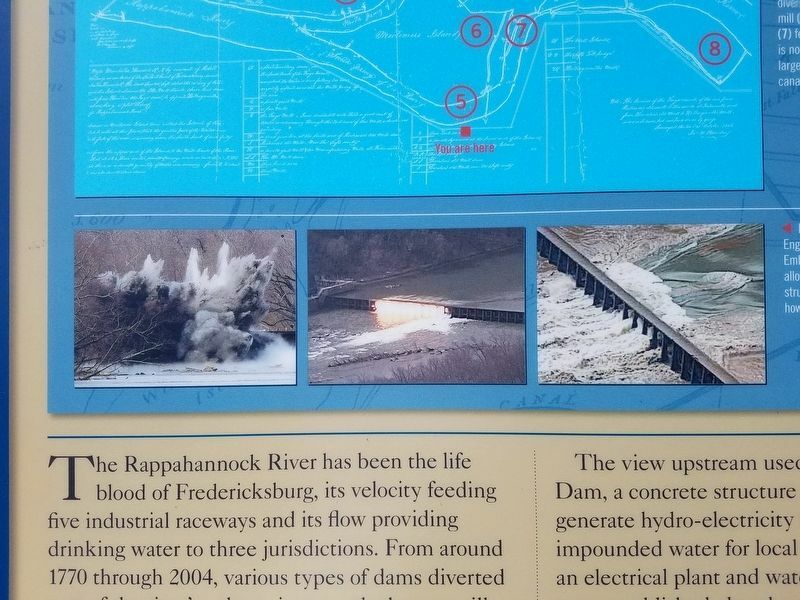 The Rappahannock River has been the life blood of Fredericksburg, its velocity feeding five industrial raceways and its flow providing drinking water to three jurisdictions. From around 1770 through 2004, various types of dams diverted part of the river's voluem into canals that are still evident today. Two canals are on the south side of the river and two on the north side. A fifth raceway crossed the island in front of you, fed by a dam across the channel to your right. The view upstream used to include the Embrey Dam, a concret structure built in 1910 that helped generate hydro-electricity for the region and also impounded water for local consumption. When an electrical plant and water impoundments were established elsewhere, the aging dam was demolished. Removal of the Embrey Dam and an 1854 crib dam behind it ended nearly 300 years of river barriers and has facilitated environmental restoration of the riverine ecosystem. This 1878 map shows Fredericksburg's two canals as well as the Falmouth Canal. The canal across the lower part of the map had been built in the 1830s as a navigation canal. A dam built in 1854, just upstream of the island, had converted it to raceway. The canal shown extending into downtown Fredericksburg was never built. (County Route 639), on the left when traveling south. Touch for map. Marker is in this post office area: Fredericksburg VA 22401, United States of America. Touch for directions. Other nearby markers. At least 8 other markers are within walking distance of this marker. 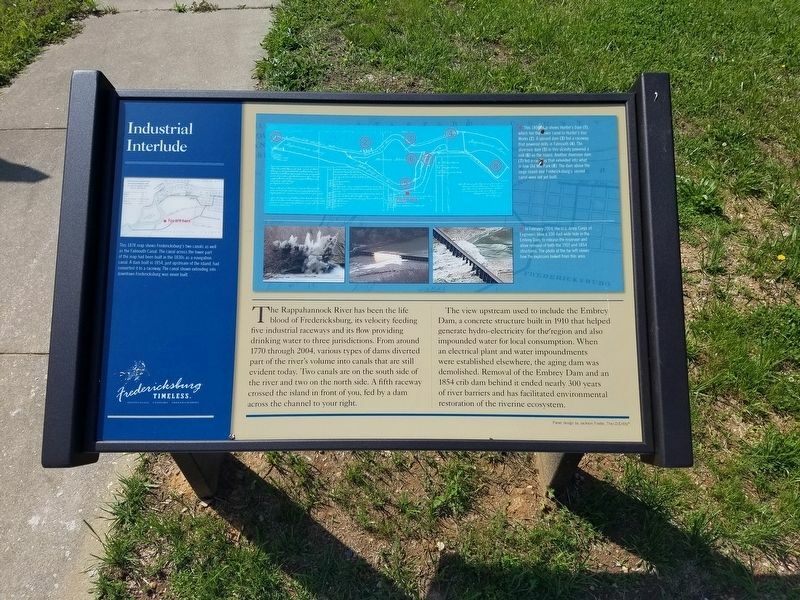 Rappahannock River Heritage Trail (approx. ¼ mile away); Amoroleck Encounters John Smith (approx. 0.3 miles away); Confederate and Federal Defenses in May 1863 (approx. 0.3 miles away); Confederate Defenses in December 1862 (approx. 0.3 miles away); “Fall Hill” (approx. 0.3 miles away); A Once Promising Canal Becomes a Raceway (approx. 0.3 miles away); a different marker also named “Fall Hill” (approx. 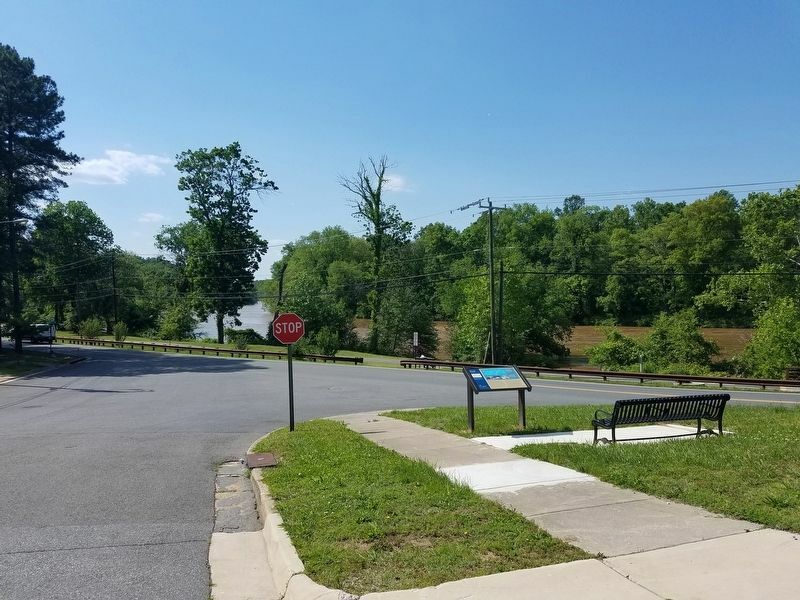 0.3 miles away); A Diversion: Second Battle of Fredericksburg (approx. 0.4 miles away). 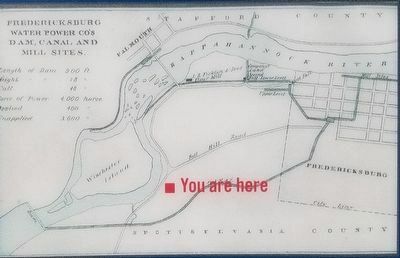 Touch for a list and map of all markers in Fredericksburg. This 1806 map shows Hunter's Dam (1), which fed the power canal to Hunter's Iron Works (2). A second dam (3) fed a raceway that powered mills in Falmouth (4). The diversion dam (5) in this vicinity powered a mill (6) on the island. Another diversion dam (7) fed a raceway that extended into what is now Old Mill Park (8). The dam above the large island and Fredericksburg's second canal were not yet built. 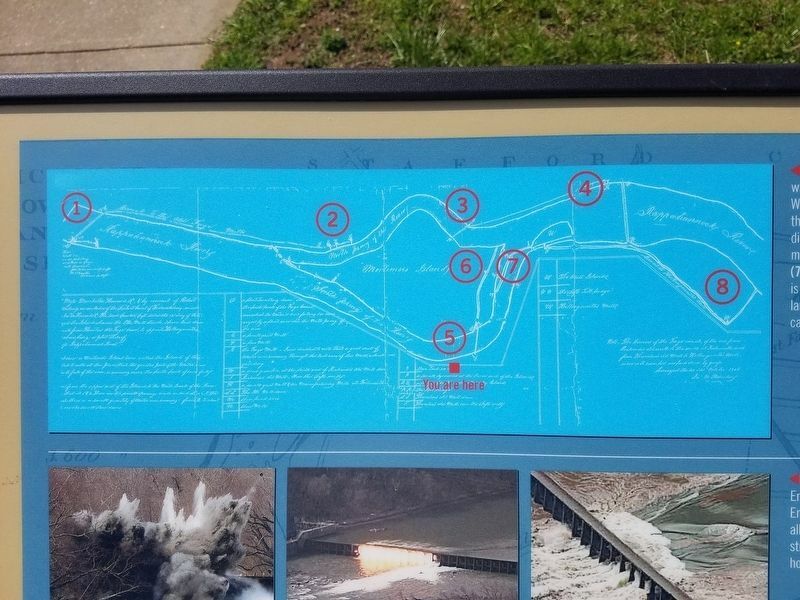 In February 2004, the U.S. Army Corps of Engineers blew a 100-foot wide hole in the Embrey Dam, to release the reservoir and allow removal of both the 1910 and 1854 structures. The photo at the far left shows how the explosion looked from this area. More. Search the internet for Industrial Interlude. Credits. This page was last revised on May 21, 2017. This page originally submitted on May 19, 2017, by Kevin W. of Stafford, Virginia. This page has been viewed 182 times since then and 5 times this year. Photos: 1, 2, 3, 4, 5. submitted on May 19, 2017, by Kevin W. of Stafford, Virginia.